We have run numerous articles on “Tusculum,” the fine old home built by David Crawford in Albemarle (later Amherst) County, Virginia. David was the father of Elizabeth Crawford, who married Nicholas Clayton Davies. Nicholas Clayton was a son of Henry Landon Davies and the grandson of Nicholas Davies (Old Nick). Many of our readers may have read these articles about Tusculum and our family’s efforts to make a significant contribution to save this piece of American history without knowing much about the history of this interesting and accomplished family. We will try to resolve this with a series of articles on our line of Crawford’s of Virginia. Composing this series is a daunting undertaking. There are several difficult problems in dealing with this family. First, the ancient origins of the family are only known as legend and there are competing legends about its early Scottish origins. Second, as was the custom among many Southern families, the same given names were given to children generation after generation. The second problem is compounded by the third, which is that generally the Crawford’s enjoyed longevity. Therefore, we have to deal with the uncertainty of always knowing which Crawford a specific court or church record is referring to. Despite these obstacles to achieving a complete understanding of Crawford history, we will proceed to tell their story as we understand it. Perhaps the posting of these articles published in this newsletter on the Davies web site will attract other descendants of the Crawford’s of Virginia who can add to or correct the information offered in these articles. Genealogy is always a work in progress. It is fairly certain that our Crawford ancestors immigrated to Virginia from Scotland. Beyond this, little else is known with certainty about the Old World origins of the Crawford’s of Virginia. Much has been written on the ancient and noble forbearers of our Crawford’s, yet it all is based on family legend and theories that have little basis in verifiable facts. The surname “Crawford” is not uncommon in Scotland . It may or may not be Gaelic in origins. Some suspect that the surname originates from two Gaelic words: cru meaning “the pass of blood” or bloody and ford, “a crossing or passage.” An opposing theory is that the name is of Norman origin, coming from Crodh meaning “cattle” and port meaning “a place of shelter.” The Norman conjunction of these two words would be crofort. 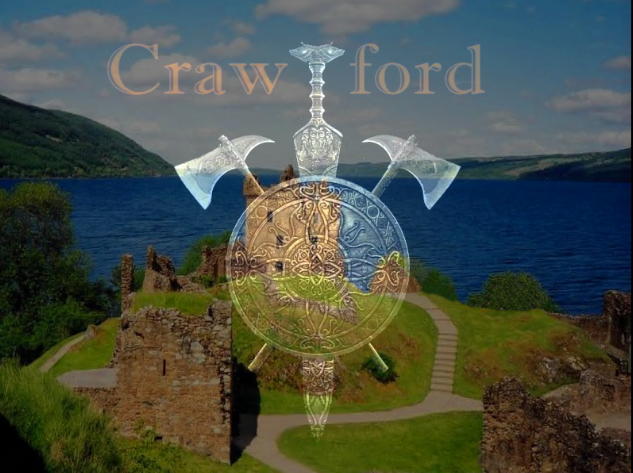 (Crawford Family) The author also came across another translation of the Norman conjunction cro-ford to mean “where crows roost at a river crossing.” Many of the early researchers of our Crawford family, who tie it to noble and royal families in Scotland, trace its origins to Medieval Scotland. 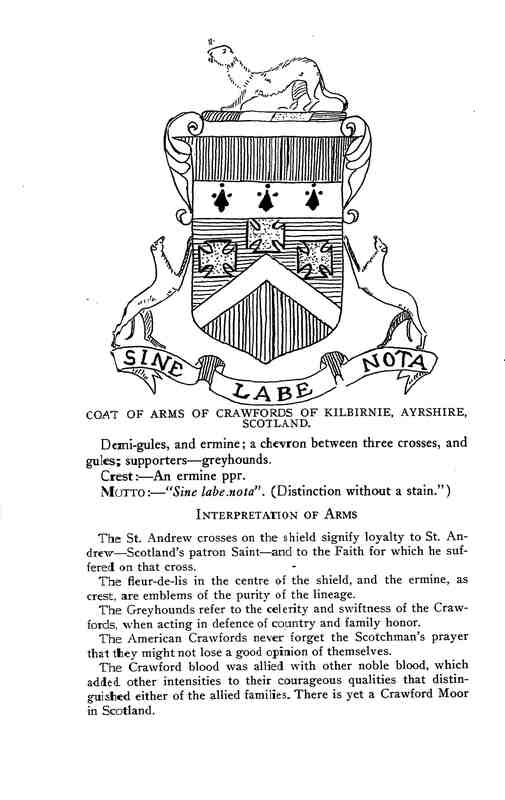 Mr. George Crawford in his family sketches found in his “History of Renfrewshire” claims that the earliest use of the surname he discovered was in 1189 when a Galfridus de Crawfurd was a witness to the declaration of independence of the Abbey of Kelso from the Episcopal See. The problem with this statement is that in the 12th century surnames had not yet come into common use. The use of surnames tended not to become prominent in Europe until an area became urbanized. Urbanization was a slow process, especially in Scotland. Surnames did not become prevalent until the late 13th century (J. N. Hook, p. 10). Therefore, what often appears to be a family surname among the more ancient people we examine is an identifier rather than a true surname, although these last names were a precursor to surnames. In other words, in the example given the “Galfridus” referred to is identifies him as the Galfridus residing at a stream crossing where either crows roost or a place where cattle are sheltered. If Galfridus had a son also named Galfridus, but who operated a mill downstream from the crofort, he may have been known as “Galfridus de Molis,” the Galfridus who owns the mill. Most researchers believe that the surname Crawford is of Norman origin. It is entirely likely that the name Crawford as we know it today evolved into a common pronunciation from all three of the possible original Norman and Celtic words discussed above. The history of Scotland is as fascinating a study as that of England, but it is one that is beyond the scope of this article. Nevertheless, a brief understanding of its ancient origins may be helpful in the understanding of the difficulty determining the origins of our Crawford line. There is a very good reason why both a possible Gaelic and Norman meaning of the surname is discussed above. Unlike Wales and Ireland, Scotland was not populated by a single ethnic group from its earliest times. Both historical and archeological evidence shows that “Alban” the Gaelic name for the Scottish people were formed by an amalgamation of two tribes, the Albanaig (men of Alban) and Picts. The name “Scotland” comes from the Latin name of the people who drove Hadrian to build his famous wall, “Scotti.” The Scotland of Roman times through the 12th century was much smaller in extent than we see it today. It extended between the Forth, the Spey and the highlands. In the far north the province of Caithness was Norse. The people who resided in Galloway were known as the “Galwegians.” Anglo-Saxons lived in Lothian, the area between the Tweed and the Forth. Running from the Clyde to the southern edge of the Lake District was inhabited by Cumbrians, a Celtic tribe that once occupied the whole of Cumbria in England. In the early 12th century King David of the Scots also refers to “Moray and Scotland” in a charter, so there must have been yet another ethnic group that the King viewed as being distinct from the Scots. To add further complexity to the cultural mix existing in Scotland, King David invited the “new French” nobility to Scotland in an effort to civilize his country. This so-called French nobility were of Norman and Norman-Anglo descent from Normandy and England. Despite the wide range of tribal groups that comprised early medieval Scotland, by the 13th century the various people came to recognize themselves as Scottish. This was accomplished without warfare and without political coercion from within. The people of what became Greater Scotland unified in response to a common enemy, the Normans of England. This included those Normans who settled in Scotland. The possible ancient origin of the Crawford family is the subject of legend. There is very little found documentation to verify or deny the legends. Yet the claim that the family descended from Sir William Wallace and was a member of the Douglas clan has been persistent through many generations of Crawfords. The exploration of the possible ancient ancestry of our Crawford line will be explored in detail in a future article. Our concern here is to pick up the history of our Crawford line where documentation exists to prove it. The progenitor of our Crawford family in Virginia was John Crawford from Kilburney, Ayrshire, Scotland, who together with his son, David, settled in James City County. The evidence that does exist suggests that John was a widower when he left Scotland for Virginia with his young son. The name of John’s wife has not been found. John and David arrived in Virginia about the year 1643. John Crawford was born in Scotland about the year 1600. Lost to us is the explanation for his leaving the comfort of the civilized environment of Scotland and venturing to a Virginia, which was still very much a wilderness outpost in the mid-17th century. Some 19th century family researchers perhaps caught up in the desire to find an ancestor with noble heritage, offered theories of his motivation for leaving Scotland. The most persistent among them was that he was the youngest son in a wealthy family and as the youngest son, he was not in line to inherit the family estate. It is more reasonable to assume that after losing his wife, John nothing holding him in Scotland and decided to seek his fortune and his son’s future prosperity in the New World. This latter scenario certainly was common among commoners and gentry alike in England, Wales, and Scotland. Not everyone immigrating to the Colonies did so because they were disinherited, or to escape political or religious persecution. Many simply came to make their fortune. Little documentation survives regarding the life of John, either in Scotland or Virginia. Most of what we know is found in Crawford family bibles written after the times of John and through family oral legend. It should be recognized, however, that simply because information comes to us by oral legend or from less than authoritative written sources themselves based on oral legend, it does not mean that the information is incorrect. The family maintains that John Crawford prospered in his new home as a planter of tobacco until the fateful year of 1676. Confronted by adverse weather, the low price of tobacco in England, mounting debt to English mercantile houses, unrest among the native tribes in reaction to English incursions in their territory, taxation imposed on Colonists by Parliament to fund the protection of the Virginia frontier and possibly the incompetent administration of Governor Sir William Berkeley all lead to rebellion against the Crown in 1676. This attempted revolution against the rule of Great Britain has come down to as “Bacon’s Rebellion” after its political leader, Nathaniel Bacon. Throughout the 18th and 19th centuries Bacon’s Rebellion was viewed by historians as the precursor to 1776. Nathaniel Bacon was portrayed as a freedom fighter struggling against the tyranny of a despotic King and Parliament. The cry of “Taxation without representation” was first raised in Virginia in 1676, only to be echoed again in the years leading to 1776. In the 20th century historians have developed a more balanced view of the causes and motivations for Bacon leading many a Virginian to war against the Mother Country. The causes general remain the same, but the interpretation of the reasons for reacting to them differs. The drop in the price of tobacco, the principal cash crop of Virginia, quickly caused prosperous planters to fall into debt to the mercantile houses for which they depended on for most of their manufactured goods, the desire to move west into Indian territory where vast estates could be founded on virgin land was being thwarted by the obstinateness of the indigenous people to peacefully vacate their ancestral lands, and over being taxed by Parliament to cover the cost of the military protection on the frontier that they demanded. So, in the 18th and 19th centuries we see those involved in Bacon’s Rebellion as the first heroes of American independence from the despotism and tyranny imposed by London, while in the 20th century we see that those involved among the colonists may have been motivated by self-interest and, in the case of Nathaniel Bacon himself, perhaps by megalomania. A careful consideration of the possible causes and motivations on both sides of the conflict is a study in and of itself. It shall be left up to the reader to pursue a study of Bacon’s Rebellion to decide for his or herself which, if either, interpretation of the conflict is correct. What we are interested in is John Crawford’s role in Bacon’s Rebellion. It is said that although at an advanced age in 1676 (probably about 76 years old) John took to his horse and joined the revolt with Bacon, serving under Bacon’s chief military officer, Giles Bland. It is further said that in reaction to what John perceived as the senseless and unwarranted slaughter of so many British settlers by the tribes on the frontier and seeing the Crown apparently incapable of dealing with the threat, “…the stern, unyielding determination to volunteer for the defense of the community, and, if need be, to offer his life as a sacrifice for the protection of other lives no more valuable that his own,” prompted him to join the Rebellion. (Crawford Family) There are two accounts of John’s death. One has it as John rode west part of a small troop to protect the frontier; he and his men were ambushed and murdered to the man by an overwhelming number of Native Americans. The other account has it that John was shot from his horse in a charge against Sir William Berkeley’s soldiers. The earliest written accounts of John’s service in Bacon’s Rebellion appear at the height of the Victorian Age, when romanticizing history and the players who made it was endemic in Western Europe and the United States. During this time history was often presented as fact without any substantiating documentation merely because it fit into the author’s image of those who lived in the noble past. In our more cynical and analytical times, many of the histories written from the mid-19th century through the early 20th century are laughable in their naivety. Yet, placing aside the flowery Victorian language and the zealous patriotism they unabashedly display, there may be a kernel of truth in these histories. Although unproven and probably unprovable, John’s possible participation in Bacon’s Rebellion should not be discounted out of hand. His having done so would fit into the character of the Crawford family both before and after John. They have a demonstrated interest in politics and law. It also fits into the noble class that John and his family is believed to have belonged. The Code of Chivalry that found its origins during the time of the Norman Conquest persisted among the nobility of Europe into the first decades of the 20th century. Therefore, it is not inconceivable that despite his advanced age John felt an obligation to take up arms to defend fellow British citizens, even if doing so meant taking up arms against an agent of the Crown. Our next encounter with our Crawfords in Virginia is with John’s son, born circa 1625 in Kilburney, Scotland when he purchased 86 acres on August 7, 1667 in the Parish of Martyns Hundred in James City County from Mrs. Anne Loveing. This land transaction was approved by the Royal Governor, Sir William Berkeley. (Land Patents for James City County, VA, Book 6) The grant of land that David acquired was made to him directly by Governor Berkeley in 1672, securing to him 1,000 acres in New Kent County “lying in yee branches of Mattedegun Creeke.” David received this land for bringing twenty people to Virginia to settle and develop the land. It was at this time that David relocated to New Kent County. David’s land acquisitions continued in 1676, the year of Bacon’s Rebellion, with 1,350 acres, 375 acres, 1,300 acres, 277 acres, and 196 acres all in New Kent County. Each of these land acquisitions were either purchases approved by the Royal Governor or direct grants made by the Governor. What is interesting is that prior family researchers have not addressed the apparent cooperation that David got from the Royal Governor while his ancient father was off fighting in open rebellion against the Governor’s administration. There are plausible explanations for this, including but limited to John Crawford not having participated in Bacon’s Rebellion, not holding a son accountable for the sins of his father, and wanting to keep David loyal to the Crown. 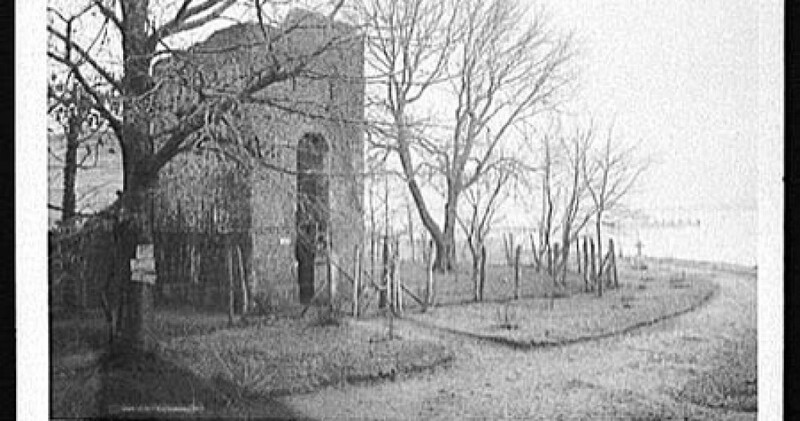 On October 28, 1681 David Crawford purchased 1,300 acres from Mr. William Taylor in St. Peter’s Parish in New Kent County and he received another land grant from the government on November 4, 1685 for an unspecified acreage that appears to have adjoined his earlier purchase from Taylor. The government granted David the land for bringing six people into the Colony to settle. It was at this site that David built his final plantation that he named “Assiskins Run” (also known as “Assassquin”). In 1693 David deeded this land over to his grandson, William Meriwether. Also, on May 12, 1697 David deeded 200 acres to his grandson, David Meriwether, with all appurtenances. This property was located in Kent County, which afterward became Hanover County. Because of the widespread destruction of public records during the Civil War we will never know the full extent of David’s landholding or how much of it he gave to his family during and upon his death. We can safely assume, however, that for the time and place in which David lived that he was a major landowner. As a Gentleman of means in Colonial Virginia David answered the call to public service. On April 2, 1692 David was elected to the House of Burgesses as one of two representatives from New Kent County. The other representative was Captain John Lyddall. David took his seat in the House on Monday, April 4, 1692. The only piece of legislation that could be found that was introduced by David was an Act requiring that County Clerks maintain an office in their respective County Courthouse. This Act passed. (H. R. McIlwaine, p 380) No doubt that David either introduced or sponsored other pieces of legislation during his two years of service in the House, but a thorough search of the Journals of the House of Burgesses was not performed. Unfortunately, the name of David’s wife is lost to us. Based on various sources, however, we can identify all or most of his children. His children are as follows: 1) Elizabeth, b. about 1650-54; married Nicholas Meriwether 2) Judith, b. 1658; married Robert Lewis and removed to the South 3) Angelina, b. 1660; married William McGuire and removed South 4) Captain David, b. 1662; d. September 1762; married Elizabeth Smith in 1695 5) John b. ? ; d. December 13, 1689; wife unknown. In subsequent articles we will explore the next generations of this fascinating family that contributed immensely to the growth and success of the Commonwealth of Virginia and to the United States during its critical formative years. We will also follow this family west to Amherst County where Captain David Crawford constructed “Tusculum,” as well as taking the occasional detour to examine the lives of those not of our direct line who settled in the deep South. This entry was posted in Crawford, Uncategorized and tagged ., Crawford Clan, Crawford Family History by Captain James Davis Genealogy. Bookmark the permalink.